Finsler geometry generalizes Riemannian geometry in the same sense that Banach spaces generalize Hilbert spaces. 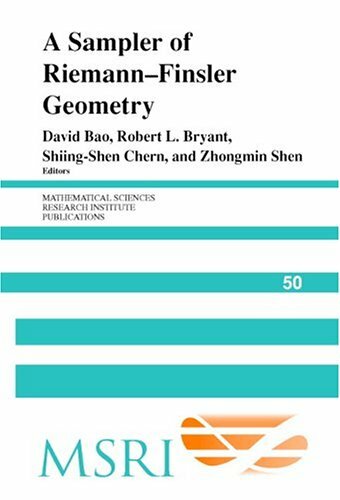 This book presents an expository account of seven important topics in Riemann-Finsler geometry, ones which have recently undergone significant development but have not had a detailed pedagogical treatment elsewhere. The contributors consider issues related to volume, geodesics, curvature, complex differential geometry, and parametrized jet bundles, and include a variety of instructive examples. Based on the lecture notes on differential geometry. From the contents: Differentiable manifolds, a brief review; Riemannian metrics; Connections; Geodesics; Curvature; Jacobi fields; Curvature and topology; Comparison geometry; The sphere theorem.